Home > Economics, Finance, Tech, Trading	> Can the Market Rally Without the Financials? Can the Market Rally Without the Financials? Many analysts and pundits alike have proclaimed that this market cannot rally without the financial sector participating. The story goes a bit like this: financial stocks led us down in 2007, they led us up in 2009 and their weakness of late will lead us lower for the duration of 2010. The question has been asked during each move, both up and down, since the March ’09 bottom. Many operate under the assumption that financial sector strength is not only necessary for the market to rally, but essential for the economy to continue. Let’s take a look at the charts to test out this thesis. 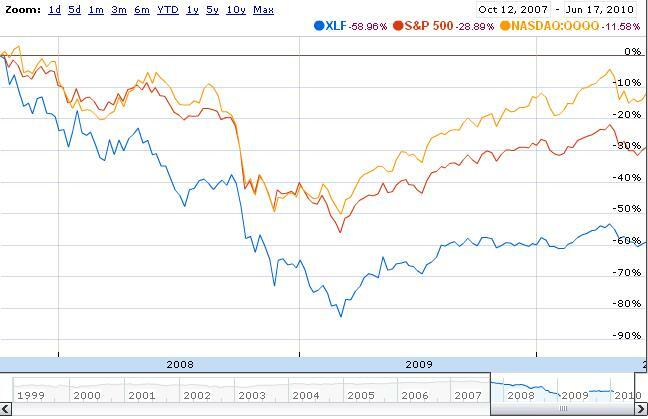 In looking at a chart of the financials (as represented by XLF) against the S&P 500 and the NASDAQ (as represented by the QQQQs) since the October 2007 market highs, one can clearly see that the financials suffered the largest decline from peak to trough. Since that time, the financials have recouped some of their losses, yet since July of 2009 they have remained stagnant while the broader markets continued higher. Moreover, the NASDAQ in particular has exhibited significant strength and prices are now just 10% off of their 2007 highs. While this is well below the all-time high set back in March of 2000, the index looks poised to regain a leadership roll. This bodes particularly well for the longer term outlook of our economy and stock market. Clearly the markets on the whole have been able to move higher without the help of the financial sector. We are in a rolling credit crisis environment and pain in the financial sector does have implications for the broader economy, but from what we have seen since the 2009 bottom, there has been an impressive recovery, and even more impressive growth in some key sectors of our economy. Pervasive weakness in the financials would not bode well for our economy, but stagnation (and under-performance) is a different story altogether. Volatility tends to be cyclical by nature. Slow and non-volatile moves tend to be followed by fast and dramatic volatility. Just like anything else, volatility itself ebbs and flows over time. From 2007 to July 2009, the financial sector went through a period of exceptional volatility and it would only be natural for the volatility to level off and the sector to stagnate. As has often been the case, prices tend to overshoot to the upside, overshoot to the downside and level off at some sort of psychological equilibrium. Following the popping of the Tech Bubble in the early 2000s, the financial sector went from being a relatively modest component of the S&P 500 to being a dominantly large sector. Moreover, since 1960, the financial sector on the whole went from accounting for 4% of our GDP, to a high of 8% prior to the 2006 peak. To an extent, this was the result of significant innovations in portfolio theory and money management; however, as we have subsequently learned, the explosion in financials from 2003 to 2007 was largely illusory in that it was built upon an explosion in leverage without the necessary economic growth to justify the rate of credit expansion. In order for our economy to recover and reemerge on a growth trajectory, it is essential for new areas of innovation and growth to emerge. That is certainly taking shape with the technology sector making an aggressive increase in its stature within the S&P 500 since 2008. Whereas at the time, Tech accounted for 15.3% of the overall S&P, as of today it is now at 18.9% . Technology remains well off its highs of 29.2% set back in 1999, but it is once again emerging as a leadership sector. Not only is it possible for our economy to grow without the financial sector, many prominent economists think (or thought) it would be the preferable model. Such thinkers include Hyman Minsky, Joseph Stiglitz and Paul Krugman, among others. The line of thinking holds that in order to maximize investment and for the economy to grow, it is preferable to pursue policies of stabilization to constrain volatility in the financial sector. A less volatile financial sector allows, and more importantly, encourages investment to flow into innovation and new technologies–the real sources of economic and job growth. If you want to understand how governments (or large private organizations) deal with problems, you need to quit thinking in terms of your family, your small business, or a chess game. This is not a situation where you see a problem, analyze alternative, identify a solution, and make a choice. It is decision making under extreme uncertainty. Most observers get this wrong. 1. The economic rebound will increase tax revenues, reducing the non-structural part of the budget deficit. (The structural deficit (simplified) is what we would still face if we were operating at full employment). 2. The consideration of the Bush tax cuts will lead to a number of compromises. Taxes will be increased, but some of the cuts will be preserved — at least in part. Like all compromises, everyone will hate the result. The final tax rates will be lower than we had in the Clinton era. 3. Entitlement benefits will be cut. This will require success from the Deficit Commission. Once again, most will hate the result, but these commissions are the only way to achieve change. With a patient and forward-looking approach, there will be exceptional investment opportunities as we continue to rebound from the 2009 lows. With interest rates and Treasury yields historically low, there is little choice for investors to chase yield outside of equities. This does not mean that every sector has to rally, and it places an increasing premium on stock selection and identifying the right themes and trends, but this can be done. The more the growth areas of our economy continue to outperform the tradition, the more optimistic our future looks. Not only CAN the market rally without the financials, should we do so, the better things look for our recovery chances. All this is not to say that the financials will not go up if/when the market does, but it does mean that the financials can become a laggard sector rather than a leader.